"I'm not gonna lie to you, Lieutenant. You're stepping into some shoes the rest of the squad would rather leave unfilled." Thom-A293 was a SPARTAN-III commando who served as a member of the UNSC Navy during the Human-Covenant War. He was a member of Noble Team until his death on April 22, 2552. Thom was orphaned in the early years of the Human-Covenant War when the Covenant glassed his homeworld. He was identified as a potential candidate for the first class of the SPARTAN-III program at a young age and, after "volunteering" for the program, was taken to the classified world Onyx for training under Lieutenant Kurt Ambrose and SCPO Franklin Mendez in late 2531. Thom was identified by Ambrose and Mendez as one of a handful of exceptional specimens within the SPARTAN-III Alpha Company and was extracted from the group before the disastrous Operation: PROMETHEUS. He and a small number of other Spartans were given MJOLNIR Powered Assault Armor and were assigned to smaller special operations units, eventually NOBLE Team. During Battle of Fumirole on April 22, 2552, Thom participated in an operation put together by Lieutenant Commander Kat-B320 to destroy a CCS-class battlecruiser maintaining position above a city. However, Kat, who carried the Medium Fusion Destructive Device intended to destroy the Covenant ship, was incapacitated while on her way to the objective by an enemy Banshee. Thom was the first to arrive to where Kat was laying wounded, picking up the nuke for her and using his jetpack to fly into the battlecruiser's gravity lift. Once inside, he threw the nuke into a crowded hangar and attempted to escape the ship before it went off, without success. The nuke detonated before Thom could safely make it out, destroying the ship and killing him. Both Commander Carter-A259 and Lt. Commander Kat took responsibility for Thom's death, unable to admit that his death was his own decision. The team's commanding officer, Colonel Urban Holland, asserted that Thom died because he chose to attack Covenant forces without waiting for backup. 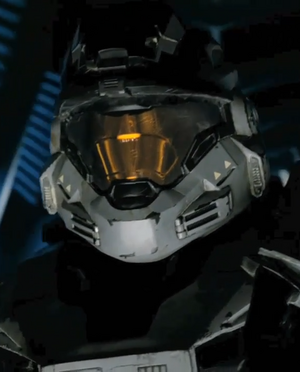 Thom was replaced on Noble Team by SPARTAN-B312 in July 2552, only days prior to the Fall of Reach. His name and service tag are seemingly a reference to Tom-B292, another SPARTAN-III. In the Deliver Hope trailer, Thom's armor is very similar to SPARTAN-B312's armor before Bungie decided to depict B312 with fully default armor in promotional materials. It is likely that Bungie gave this image to Thom to help associate the image with his successor S-B312. Thom was originally intended to play a larger role in Halo: Reach as a living member of Noble Team, and was described to be "cowboy-like". However, like Rosenda-A344, he was ultimately cut from the game and only mentioned in the Noble Team performance reports as a now-deceased former member. The manner of Thom's death, ensuring the detonation of a bomb within a Covenant ship, is remarkably similar to the deaths of Samuel-034 and Jorge-052. However, in Samuel and Jorge's cases, they chose to stay behind due to Samuel having to stay in the Covenant ship due to an armor breach and Jorge having to manually detonate improvised Slipspace drive "bomb", while Thom could not get out of the battlecruiser in time. A concept image of Thom's face bears a remarkable resemblance to Jason Jones, one of the co-founders of Bungie. "Thom" is one of the name options for customized loadouts in Halo: Reach, along with the other members of Noble Team and several SPARTAN-IIs. Thom's service tag may be a reference to the number seven (2+9+3=14=7*2). Early concept art of Thom. Concept art of Thom in his MJOLNIR armor. Thom-A293 using a jetpack to plant a Medium Fusion Destructive Device on a Covenant CCS-class battlecruiser. Thom gazes into the cruiser's hangar bay just as he is about to deploy the MFDD. Thom during the Battle of Fumirole in April 2552.